Political startup Ruck.us has raised half a million dollars and made a major switch from the political social network it started out as back in 2011 to a local political fundraising platform. The site went through a reboot after it didn’t get the votes needed to make a social play over the last few years. It did, however, figure out a larger need in local politics – a free way for grassroots politicians to create websites to raise money online. Co-founder Nathan Daschle (yes, former U.S. Senator Tom Daschle’s son) alludes to it as a community-based Kickstarter for your local school board rep.
“We’re hoping that Ruck.us will help level the playing field in the races that matter,” says Daschle. In the process he and his co-founders Jonathan Zucker and angel investor Leo Wang realized they were actually building something that a lot of political candidates might possibly want. And so pivot, they did. Now Ruck.us, flush with half a million to keep itself going, has partnered with the Democratic Parties in Maryland, Idaho, and Michigan to get candidates and local and county party organizations online. “Our partnership with Ruck.us is at the center of our effort to revamp our digital infrastructure,” says Michigan Democratic Party chair Lon Johnson. According to the Michigan Campaign Finance Network, campaign expenditures for Michigan State House races totaled nearly $20 million. It should be noted here that Ruck.us is a free platform. It makes its money by charging 5.75 percent of funds raised, or net 2 percent, much like a Kickstarter or Indiegogo monetization model. Of course, there are other solutions out there besides Ruck.us. A local school board rep could cobble together a WordPress page that hooks into Facebook and a host of other applications instead of Ruck.us. They could also get a website custom-made or just gin up a Facebook page and hook it into PayPal. Some of this would take either a lot of work or some technical know-how to do – technical know-how that may seem very simple to those in the tech community but not necessarily to a local person running for office. Daschle says the grassroots politicians really needed a one-stop shop for this sort of thing. 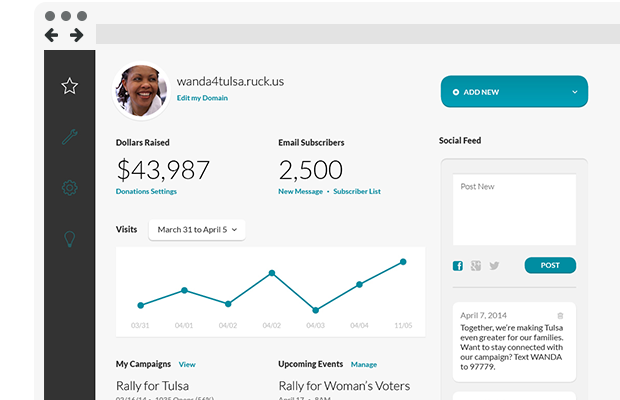 Ruck.us offers bundled event management, an email blaster, social media marketing, a free donations page, and provides the data needed for political campaign finance filing, all on one platform. It came as a surprise to Daschle how easy the buy-in has been with local candidates. “It’s just harder to find the ones not already online yet,” he tells me. Next up is to target the five states that will hold statewide elections next year—Virginia, New Jersey, Kentucky, Louisiana, and Mississippi. Daschle believes this new Ruck.us will be the digital change local candidates need in their political world. “The ability to state your issues and communicate them clearly on the Internet can be the difference in winning a race, and a website from the late ‘90s isn’t going to cut it,” Daschle says. We’ll be waiting to see if this new iteration of Ruck.us will actually rock the vote on a local level as well.